Pull-up knee sleeves the simplest type of knee support, offering compression, support and warmth to the knee. They are really simple to use, cheap, and come in a variety of sizes to ensure that they fit correctly. 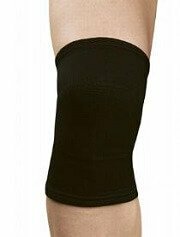 Knee sleeves can really help in the first few days following minor knee injuries to take some strain off the joint and give it some support. They can also be helpful for longer term problems to give the knee that bit of extra support so you can keep going with your normal activities. They are also a great item to have in the first-aid kit in case of injury. 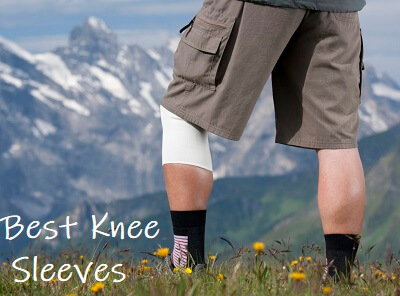 Knee sleeves provide basic protection and are perfect for mild knee pain, sprains, arthritis, weakness, tendonitis, cartilage irritation and knee swelling. Not only do they provide some support for the knee, they also help retain heat which boosts the circulation to the joint and can aid healing. 3)	Inbuilt Stabilisers: Some have side stabilisers which provide extra support for the knee ligaments. There are a number of different knee sleeves on the market. Here I share with you my favourite, those that people find comfortable, supportive and good value for money. They are all from trusted brands, and can work really well to reduce pain, swelling and weakness. You will find size guides at the bottom of the page to ensure you get the perfect fit for you. 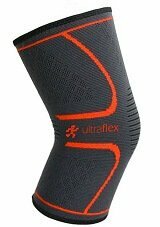 The Ultra Flex Athletics Knee Sleeve is designed for optimal compression grade to improve muscle endurance, protect the knee and enhance recovery. Available in three sizes. Overview: The Mava compression sleeve provides support and compression, increasing circulation to the knee and relieving pain. Made from breathable, moisture-wicking, antimicrobial material, it is suitable for everyday wear. 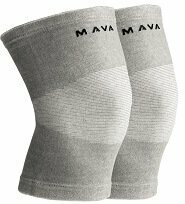 Mava Compression Sleeves are sold in pairs and available in grey or black and in four sizes. My verdict: Mava sleeves are extremely popular and come with a 30-day money back guarantee. They are good value as you get two sleeves in the box, perfect if you need one for each knee, or so that you have a spare for when washing etc. Average user rating 4.5/5. Overview: This ACE sleeve provides support and stability without restricting movement. Has flexible metal side stabilizers providing medial and lateral stability by simulating the action of the knee ligaments. The ACE Brace With Side Stabilisers is designed for use with arthritis, general knee soreness and swelling. Supports weakened muscles, tendons and ligaments and helps reduce the risk of injury. My verdict: I like the side stabilizers here for extra stability. Users rate it highly for comfort, support and durability. Average user rating 4.2/5. Overview: A popular pull on sleeve providing mild support, compression and warmth, helping to promote healing and reduce pain. The shape and size ensures it fits well, unlike many cheaper brands. It is also seamless behind the knee for extra comfort. The McDavid Knee Support is available for the left or right knee and comes in five sizes. My verdict: This popular knee sleeve is excellent value for money and is my favourite closed knee support. It is easy to apply, stays in place, and is made of heavy duty material so is long-lasting. Average user rating 4.4/5. Overview: Black pull on sleeve providing stabilization and warmth to the knee. Made of elastoprene – an innovative combination of breathable elastic and neoprene blend materials. This provides support and retains heat to help reduce swelling and aid healing, whilst releasing moisture to prevent excess sweating. My verdict: This is a great simple pull up sleeve that provides moderate support. I like the elastoprene material that gives the benefits of heat retention to improve healing without making the leg all sweaty. Average user rating 4.3/5. Overview: A popular pull on sleeve providing mild support and compression to the knee. This model features a hole and buttress at the front to reduce pressure on the kneecap, improving comfort and flexion. My verdict: People report that is very comfy even when worn all day. It comes in a reversible black/red so you can choose which you prefer. Average user rating 4.1/5. Overview: This popular lightweight elastic pull on sleeve offers firm support for stiff, weak or sore knees without inhibiting movement. Its contoured design helps prevent bunching and slippage to ensure a proper fit. It provides compression and retains warmth to promote healing and reduce pain, making it perfect after minor injuries or if you just need that bit of extra support. 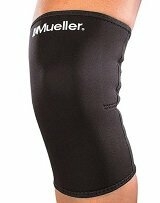 My verdict: The Mueller Knee Support is a good basic pull on knee sleeve offering basic support and protection. Average user rating 4.1/5. If you are looking for a brace that provides more support, or you would prefer an adjustable brace, I recommend checking out the knee brace overview which explains all about the different types of braces on the market and which ones get the best user reviews. It is really important to get the correct size knee sleeve, to ensure a correct, comfortable fit and to get the right level of support. To get an accurate fit, measure around the knee and chose from the options below. If your knee size falls between two sizes, it is usually best to go for the larger size.